Hello all, New here not new to Car Audio or Alarms. Well here is the issue and I don't understand where I am going wrong. After looking at the BCM and finding the Lock + wire Taping the wire, Tested it for function, I couldn't find the P/V wire. Taking the 2 plugs out of the Bcm is kind of crazy. The doors still unlock but won't lock. With plug c2 out I tested all the wires and found a Blue wire that rested at ground and went to 12V + with the Passenger side switch. So installed a Tap there and with a test wire connected to a fuse I tried to use that wire as my unlock + and only pops the fuse in my test wire. 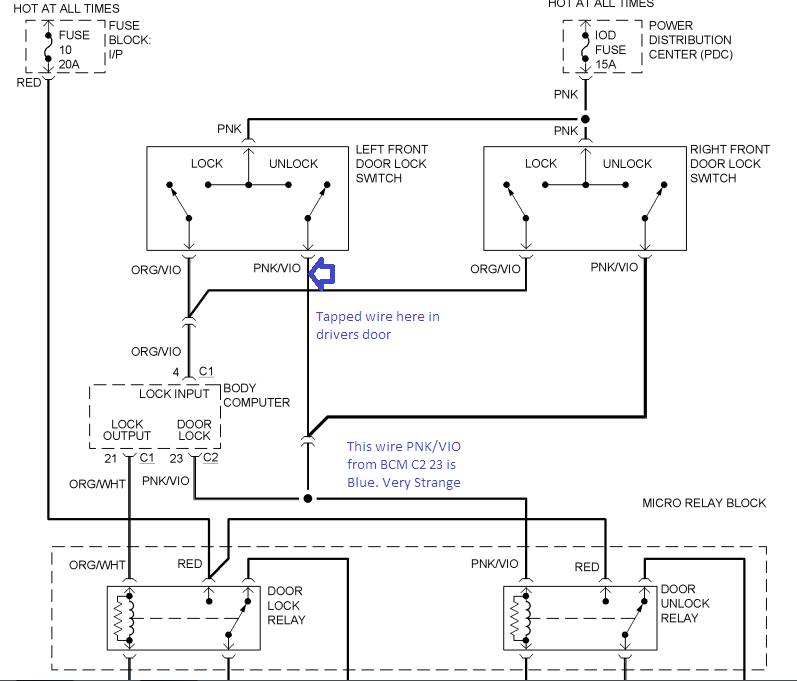 So strange thing is I am looking at the Door Locks Diagram for the van and it confirms that the Wire to unlock is P/V and is in c2 at pin 23. THis I found after the Rain came and sun went down so I haven't looked yet. The problem is there is no other wire on the C2 that act like the lock side. Also another thing that is strange and I haven't installed for many many years. Still have the tools from back in my install days. This only mention because I am using a Test light Called the Probe from Snap-On bought back in the mid 90's If not seen one or used one it is computer safe (said to be anyway) and show 12+ and 12V- by the way of a red or Green light. While probing C1 I found a wire *Not sure the color right now) where touching it with the probe would make the door lock. Anyone have some Insight on this would be helpful. Last edited by TheVanMan; 02-07-2015 at 11:22 PM.